Ryan-Keogh T J, Thomalla S.J., Little, Melanson, J-R. Active fluorescence measurements can provide rapid, non-intrusive estimates of phytoplankton primary production at high spatial and temporal resolution, but there is uncertainty in converting from electrons to ecologically relevant rates of CO2 assimilation. In this study, we examine the light-dependent rates of photosynthetic electron transport and 13C-uptake in the Atlantic sector of the Southern Ocean to derive a conversion factor for both winter (July 2015–August 2015) and summer (December 2015–February 2016). The results revealed significant seasonal differences in the light-saturated chlorophyll specific rate of 13C-uptake, (PBmax), with mean summer values 2.3 times higher than mean winter values, and the light limited chlorophyll specific efficiency, (αB), with mean values 2.7 times higher in summer than in winter. Similar patterns were observed in the light-saturated photosynthetic electron transport rates (ETRRCIImax, 1.5 times higher in summer) and light limited photosynthetic electron transport efficiency (αRCII, 1.3 times higher in summer). The conversion factor between carbon and electrons (Φe:C (mol e– mol C-1)) was derived utilizing in situ measurements of the chlorophyll-normalized number of reaction centers (nRCII), resulting in a mean summer Φe:C which was 3 times lower than the mean winter Φe:C. Empirical relationships were established between Φe:C, light and NPQ, however they were not consistent across locations or seasons. 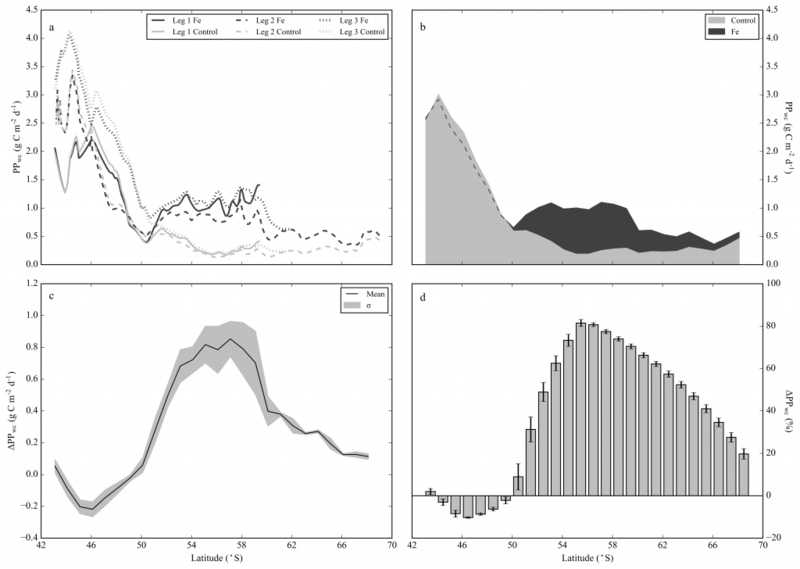 The seasonal decoupling of Φe:C is the result of differences in Ek-dependent and Ek-independent variability, which require new modelling approaches and improvements to bio-optical techniques to account for these inter-seasonal differences in both taxonomy and environmental mean conditions. 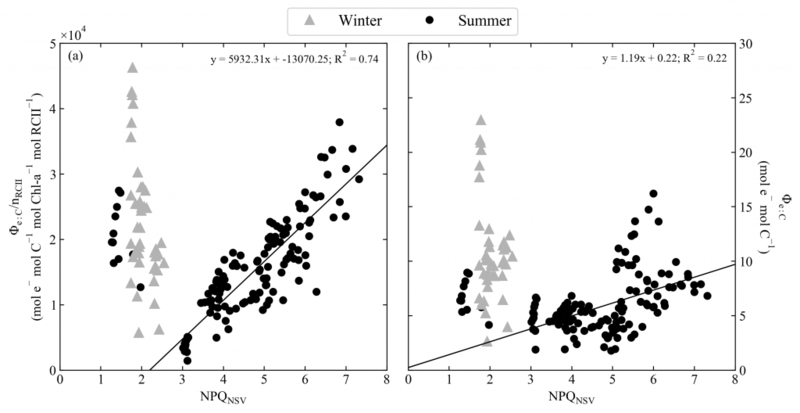 (a) Correlation of non photochemical quenching, NPQNSV, and Φe:C/nRCII (mol e– mol C-1 mol Chl a-1 mol RCII-1); (b) correlation of NPQNSV and Φe:C (mol e– mol C-1). Values of NPQNSV and Φe:C were derived from light response curves of 13C-uptake and FLC measurements. Linear regressions calculated for summer (excluding points on far left from ICE station—see Supporting Information Fig. S12): all p<0.001. °The seasonal and sub-seasonal dynamics of iron availability within the sub-Antarctic zone (SAZ; 40–45°S) play an important role in the distribution, biomass and productivity of the phytoplankton community. The variability in iron availability is due to an interplay between winter entrainment, diapycnal diffusion, storm-driven entrainment, atmospheric deposition, iron scavenging and iron recycling processes. Biological observations utilizing grow-out iron addition incubation experiments were performed at different stages of the seasonal cycle within the SAZ to determine whether iron availability at the time of sampling was sufficient to meet biological demands at different times of the growing season. Here we demonstrate that at the beginning of the growing season, there is sufficient iron to meet the demands of the phytoplankton community, but that as the growing season develops the mean iron concentrations in the mixed layer decrease and are insufficient to meet biological demand. Phytoplankton increase their photosynthetic efficiency and net growth rates following iron addition from midsummer to late summer, with no differences determined during early summer, suggestive of seasonal iron depletion and an insufficient resupply of iron to meet biological demand. The result of this is residual macronutrients at the end of the growing season and the prevalence of the high-nutrient low-chlorophyll (HNLC) condition. We conclude that despite the prolonged growing season characteristic of the SAZ, which can extend into late summer/early autumn, results nonetheless suggest that iron supply mechanisms are insufficient to maintain potential maximal growth and productivity throughout the season. 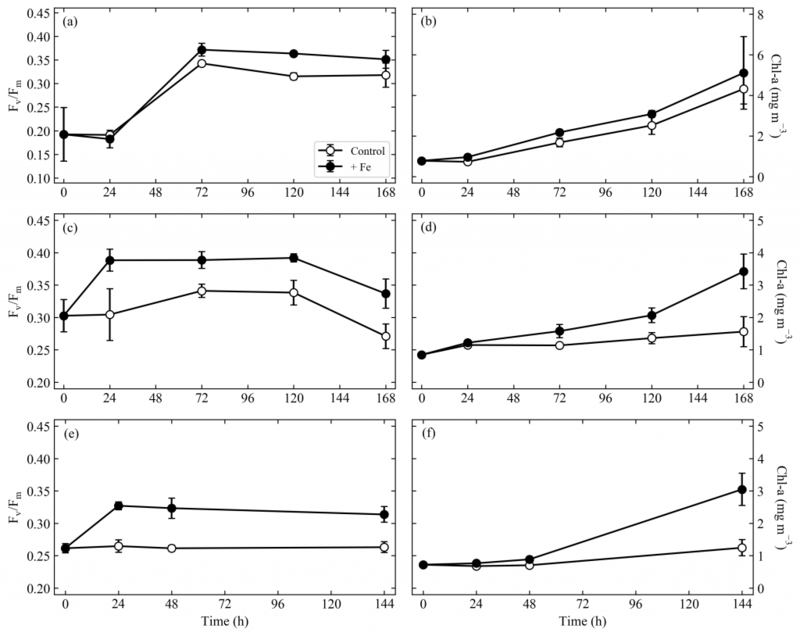 Fv/Fm (a, c, e) and chlorophyll a (Chl a) responses (mg m3) (b, d, f), from the control and Fe addition treatments of experiments initiated in the sub-Antarctic zone over early summer (a, b), midsummer (c, d) and late summer (e, f). Displayed here are averages with standard deviations (n = 3-5 for all time points, except the end time point where n = 6-12; see Table S1 for exact sample numbers). Please note the different scales in panels (a) and (b). Little, Vichi M., Thomalla S.J., Swart S.
Box-and-whisker plots for the mean and standard deviation for subsampling at periodic frequencies (blue boxes) and the corresponding random extraction (red boxes) for the summer surface chl-a time series. Resolving and understanding the drivers of variability of CO2 in the Southern Ocean and its potential climate feedback is one of the major scientific challenges of the ocean-climate community. Here we use a regional approach on empirical estimates of pCO2 to understand the role that seasonal variability has in long-term CO2 changes in the Southern Ocean. Machine learning has become the preferred empirical modelling tool to interpolate time- and location-restricted ship measurements of pCO2. In this study we use an ensemble of three machine-learning products: support vector regression (SVR) and random forest regression (RFR) from Gregor et al. (2017), and the self-organising-map feed-forward neural network (SOM-FFN) method from Landschützer et al. (2016). The interpolated estimates of ΔpCO2 are separated into nine regions in the Southern Ocean defined by basin (Indian, Pacific, and Atlantic) and biomes (as defined by Fay and McKinley, 2014a). The regional approach shows that, while there is good agreement in the overall trend of the products, there are periods and regions where the confidence in estimated ΔpCO2 is low due to disagreement between the products. The regional breakdown of the data highlighted the seasonal decoupling of the modes for summer and winter interannual variability. Winter interannual variability had a longer mode of variability compared to summer, which varied on a 4–6-year timescale. We separate the analysis of the ΔpCO2 and its drivers into summer and winter. We find that understanding the variability of ΔpCO2 and its drivers on shorter timescales is critical to resolving the long-term variability of ΔpCO2. Results show that ΔpCO2 is rarely driven by thermodynamics during winter, but rather by mixing and stratification due to the stronger correlation of ΔpCO2 variability with mixed layer depth. Summer pCO2 variability is consistent with chlorophyll a variability, where higher concentrations of chlorophyll a correspond with lower pCO2 concentrations. In regions of low chlorophyll a concentrations, wind stress and sea surface temperature emerged as stronger drivers of ΔpCO2. In summary we propose that sub-decadal variability is explained by summer drivers, while winter variability contributes to the long-term changes associated with the SAM. 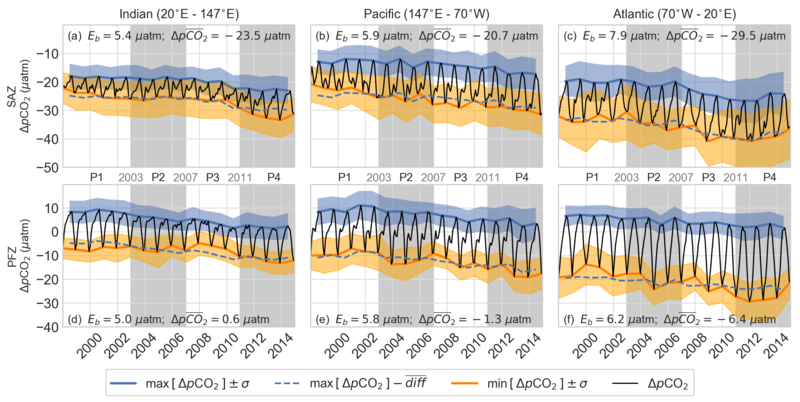 This approach is a useful framework to assess the drivers of ΔpCO2 but would greatly benefit from improved estimates of ΔpCO2 and a longer time series. Panels (a–f) show the ensemble mean of ∆pCO2 (black) plotted by biome (rows) and basin (columns). Biomes are defined by Fay and McKinley (2014a). The blue line shows the maximum for each year (winter outgassing) and the dashed blue line shows the same line less the average seasonal amplitude (diff) – this is the expected amplitude. The orange line shows the minimum ∆pCO2 for each summer season. The shaded regions around the seasonal maxima and minima show the standard deviation of the three products. Eb is the average between-method error and ∆pCO2 is the average for the entire time series. Light grey shading in (a–f) shows the periods used in Figs. used for comparisons. Autonomous platforms will begin to address the space-time gaps required to improve estimates of phytoplankton distribution, which will aid in the quantification of baseline conditions necessary to detect long-term trends that can be attributed to factors such as climate change. However, there is a need for high quality controlled and verified datasets. In vivo fluorescence provides a proxy for chlorophyll pigment concentration, but it is sensitive to physiological downregulation under incident irradiance (fluorescence quenching). Quenching can undermine the validity of these datasets by underestimating daytime fluorescence derived chlorophyll across regional and temporal scales. Existing methods from the literature have corrected for quenching, however, these methods require certain assumptions to be made that do not hold true across all regions and seasons. The method presented here overcomes some of these assumptions to produce corrected surface fluorescence during the day that closely matched profiles from the previous (or following) night, decreasing the difference to less than 10%. This method corrects daytime quenched fluorescence using a mean nighttime profile of the fluorescence to backscattering ratio multiplied by daytime profiles of backscattering from the surface to the depth of quenching (determined as the depth at which the day fluorescence profile diverges from the mean night profile). 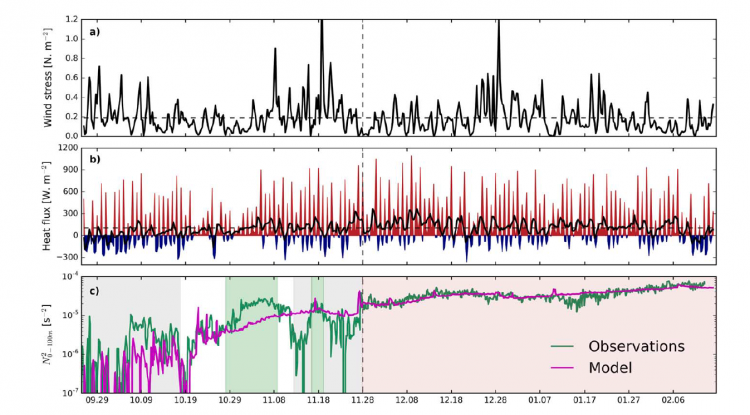 This method was applied to a 7-month glider time series in the sub-Antarctic Southern Ocean together with four other methods from the literature for comparison. In addition, the method was applied to a glider time series from the North Atlantic to demonstrate its applicability to other ocean regions. Time series of surface midnight fluorescence (black line) and midday uncorrected fluorescence (grey line) from 28 July 2015 to 8 February 2016, together with midday corrected fluorescence using 5 different methods (Xing et al. 2012; Biermann et al. 2012; Swart et al. 2015; Hemsley et al. 2015; Thomalla et al. this study). The Southern Ocean accounts for 40 % of oceanic CO2 uptake, but the estimates are bound by large uncertainties due to a paucity in observations. Gap-filling empirical methods have been used to good effect to approximate pCO2 from satellite observable variables in other parts of the ocean, but many of these methods are not in agreement in the Southern Ocean. In this study we propose two additional methods that perform well in the Southern Ocean: support vector regression (SVR) and random forest regression (RFR). The methods are used to estimate ΔpCO2 in the Southern Ocean based on SOCAT v3, achieving similar trends to the SOM-FFN method by Landschützer et al. (2014). Results show that the SOM-FFN and RFR approaches have RMSEs of similar magnitude (14.84 and 16.45 µatm, where 1 atm = 101 325 Pa) where the SVR method has a larger RMSE (24.40 µatm). However, the larger errors for SVR and RFR are, in part, due to an increase in coastal observations from SOCAT v2 to v3, where the SOM-FFN method used v2 data. The success of both SOM-FFN and RFR depends on the ability to adapt to different modes of variability. The SOM-FFN achieves this by having independent regression models for each cluster, while this flexibility is intrinsic to the RFR method. Analyses of the estimates shows that the SVR and RFR’s respective sensitivity and robustness to outliers define the outcome significantly. Further analyses on the methods were performed by using a synthetic dataset to assess the following: which method (RFR or SVR) has the best performance? What is the effect of using time, latitude and longitude as proxy variables on ΔpCO2? What is the impact of the sampling bias in the SOCAT v3 dataset on the estimates? We find that while RFR is indeed better than SVR, the ensemble of the two methods outperforms either one, due to complementary strengths and weaknesses of the methods. 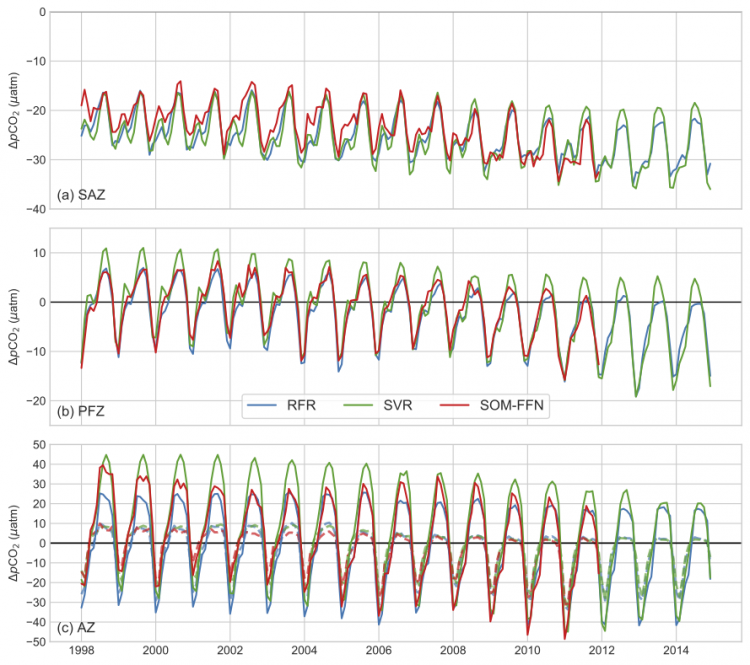 Results also show that for the RFR and SVR implementations, it is better to include coordinates as proxy variables as RMSE scores are lowered and the phasing of the seasonal cycle is more accurate. Lastly, we show that there is only a weak bias due to undersampling. The synthetic data provide a useful framework to test methods in regions of sparse data coverage and show potential as a useful tool to evaluate methods in future studies. Time series of ∆pCO2 estimates for the three Southern Ocean biomes as defined by Fay and McKinley (2014): SAZ, PFZ and MIZ. The y-axis grid lines represent the same scale for figures (a) through (c). The SOM-FFN estimates are only available until 2011 as it is trained with SOCAT v2, while the SVR and RFR are trained with SOCAT v3. The ∆pCO2 normalized to sea ice cover is shown by dashed lines in the AZ. 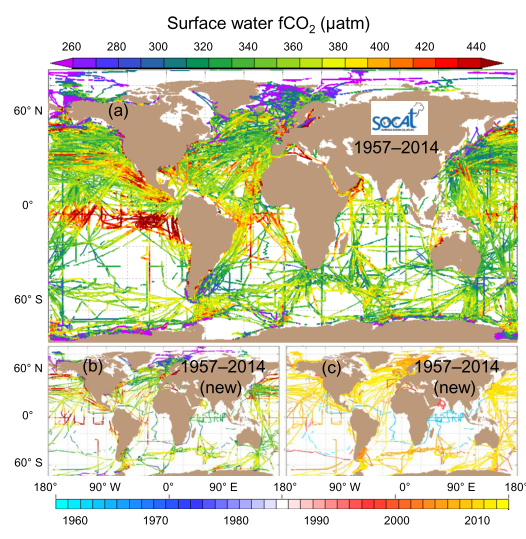 The Surface Ocean CO2 Atlas (SOCAT) is a synthesis of quality-controlled fCO2 (fugacity of carbon dioxide) values for the global surface oceans and coastal seas with regular updates. Version 3 of SOCAT has 14.7 million fCO2 values from 3646 data sets covering the years 1957 to 2014. This latest version has an additional 4.6 million fCO2 values relative to version 2 and extends the record from 2011 to 2014. Version 3 also significantly increases the data availability for 2005 to 2013. SOCAT has an average of approximately 1.2 million surface water fCO2 values per year for the years 2006 to 2012. Quality and documentation of the data has improved. A new feature is the data set quality control (QC) flag of E for data from alternative sensors and platforms. The accuracy of surface water fCO2 has been defined for all data set QC flags. Automated range checking has been carried out for all data sets during their upload into SOCAT. The upgrade of the interactive Data Set Viewer (previously known as the Cruise Data Viewer) allows better interrogation of the SOCAT data collection and rapid creation of high-quality figures for scientific presentations. Automated data upload has been launched for version 4 and will enable more frequent SOCAT releases in the future. 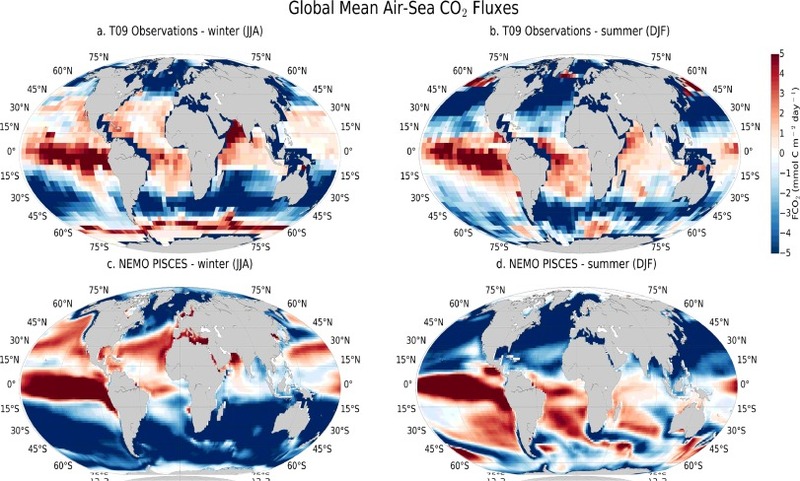 High-profile scientific applications of SOCAT include quantification of the ocean sink for atmospheric carbon dioxide and its long-term variation, detection of ocean acidification, as well as evaluation of coupled-climate and ocean-only biogeochemical models. Users of SOCAT data products are urged to acknowledge the contribution of data providers, as stated in the SOCAT Fair Data Use Statement. This ESSD (Earth System Science Data) “living data” publication documents the methods and data sets used for the assembly of this new version of the SOCAT data collection and compares these with those used for earlier versions of the data collection (Pfeil et al., 2013; Sabine et al., 2013; Bakker et al., 2014). Individual data set files, included in the synthesis product, can be downloaded here: doi:10.1594/PANGAEA.849770. The gridded products are available here: doi:10.3334/CDIAC/OTG.SOCAT_V3_GRID. Global distribution of (a) all and (b) newly added surface water fCO2 values (µatm) and (c) the timing of the newly added data sets in SOCAT version 3 with data set flags of A to E. Version 3 has data sets from 1957 to 2014. 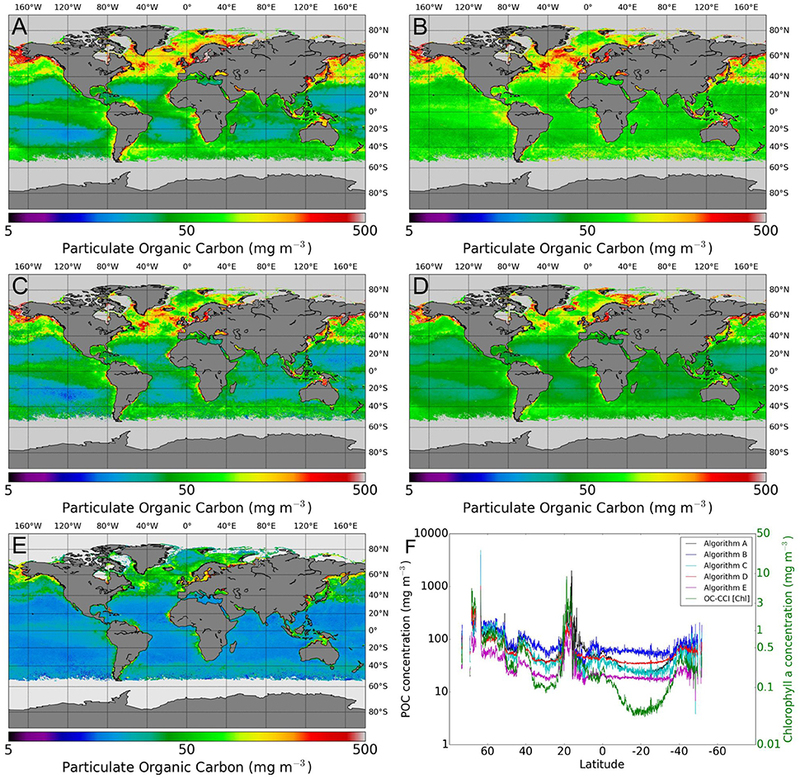 Particulate Organic Carbon (POC) plays a vital role in the ocean carbon cycle. Though relatively small compared with other carbon pools, the POC pool is responsible for large fluxes and is linked to many important ocean biogeochemical processes. The satellite ocean-color signal is influenced by particle composition, size, and concentration and provides a way to observe variability in the POC pool at a range of temporal and spatial scales. To provide accurate estimates of POC concentration from satellite ocean color data requires algorithms that are well validated, with uncertainties characterized. Here, a number of algorithms to derive POC using different optical variables are applied to merged satellite ocean color data provided by the Ocean Color Climate Change Initiative (OC-CCI) and validated against the largest database of in situ POC measurements currently available. The results of this validation exercise indicate satisfactory levels of performance from several algorithms (highest performance was observed from the algorithms of Loisel et al., 2002; Stramski et al., 2008) and uncertainties that are within the requirements of the user community. Estimates of the standing stock of the POC can be made by applying these algorithms, and yield an estimated mixed-layer integrated global stock of POC between 0.77 and 1.3 Pg C of carbon. Performance of the algorithms vary regionally, suggesting that blending of region-specific algorithms may provide the best way forward for generating global POC products. 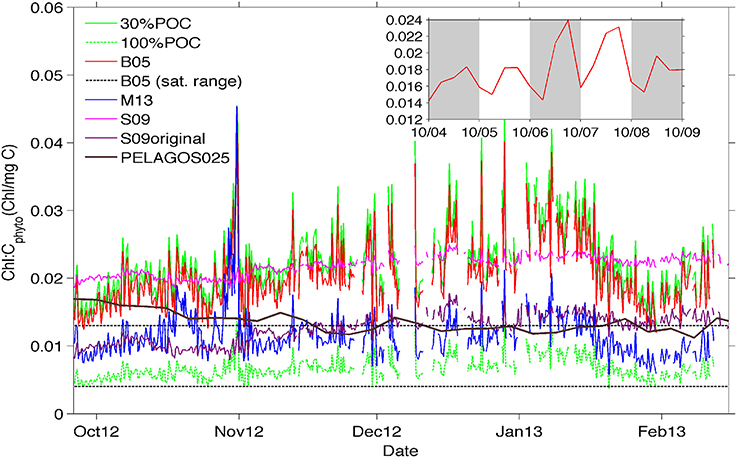 POC estimated using the five candidate algorithms applied to a monthly composite of OC-CCI data from May 2005 (A) Stramski et al. (2008) (Rrs), (B) Stramski et al. (2008) (bbp), (C) Loisel et al. (2002), (D) Gardner et al. (2006), (E) Kostadinov et al. (2016), and (F) POC associated with an extracted transect through the Atlantic at 20o W for each algorithm, and the associated [Chl] from the OC-CCI data. Eleven incubation experiments were conducted in the South Atlantic sector of the Southern Ocean to investigate the relationship between new production (ρNO3 –), regenerated production (ρNH4 +), and total carbon production (ρC) as a function of varying light. The results show substantial variability in the photosynthesis–irradiance (P vs E) parameters, with phytoplankton communities at stations that were considered iron (Fe)-limited showing low maximum photosynthetic capacity (PB max) and low quantum efficiency of photosynthesis (αB) for ρNO3, but high PB max and αB for ρNH4, with consequently low export efficiency. Results at stations likely relieved of Fe stress (associated with shallow bathymetry and the marginal ice zone) showed the highest rates of PB max and αB for ρNO3 and ρC. To establish the key factors influencing the variability of the photosynthetic parameters, a principal components analysis was performed on P vs E parameters, using surface temperature, chlorophyll-a concentration, ambient nutrients, and an index for community size structure. 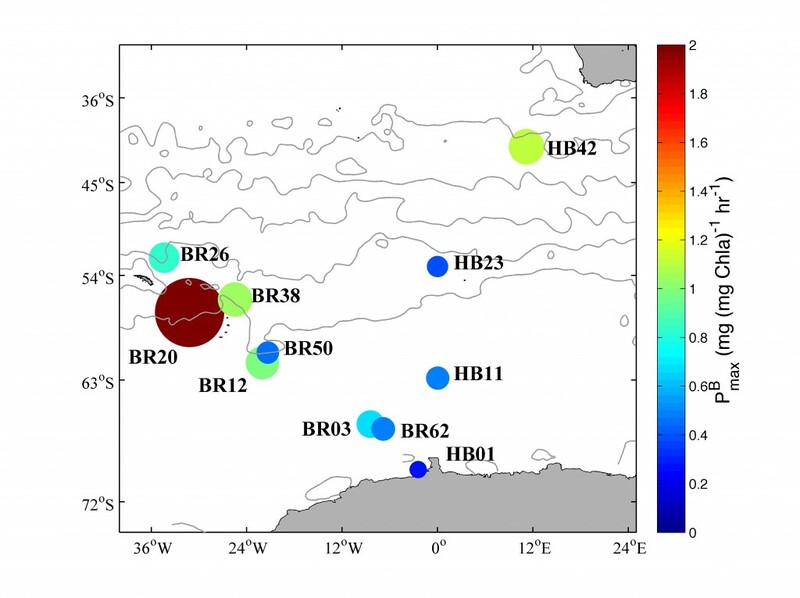 Strong covariance between ambient nitrate (NO3) and αB for ρNO3 suggests that Fe and possibly light co-limitation affects the ability of phytoplankton in the region to access the surplus NO3 reservoir. However, the observed relationships between community structure and the P vs E parameters suggest superior performance by smaller-sized cells, in terms of resource acquisition and Fe limitation, as the probable driver of smaller-celled phytoplankton communities that have reduced photosynthetic efficiency and which require higher light intensities to saturate uptake. A noticeable absence in covariances between chlorophyll-a and αB, between PB max and αB, and between temperature and αB may have important implications for primary-production models, although the absence of some expected relationships may be a consequence of the small dataset and low range of variability. However, significant relationships were observed between ambient NO3 and αB for ρNO3, and between the light-saturation parameter Ek for ρNO3 and the phytoplankton community’s size structure, which imply that Fe and light co-limitation drives access to the surplus NO3 reservoir and that larger-celled communities are more efficient at fixing NO3 in low light conditions. Although the mean PB max results for ρC were consistent with estimates of global production from satellite chlorophyll measurements, the range of variability was large. These results highlight the need for more-advanced primary-production models that take into account a diverse range of environmental and seasonal drivers of photosynthetic responses. du Plessis M., Swart S., Ansorge I. J., Mahadevan A. Traditionally, the mechanism driving the seasonal restratification of the Southern Ocean mixed layer (ML) is thought to be the onset of springtime warming. Recent developments in numerical modelling and North Atlantic observations have shown that submesoscale ML eddies (MLE) can drive a restratifying flux to shoal the deep winter ML prior to solar heating at high latitudes. The impact of submesoscale processes on the intra-seasonal variability of the Subantarctic ML is still relatively unknown. We compare five months of glider data in the Subantarctic Zone to simulations of a 1-D mixing model to show that the magnitude of restratification of the ML cannot be explained by heat, freshwater and momentum fluxes alone. During early spring, we estimate that periodic increases in the vertical buoyancy flux by MLEs caused small increases in stratification, despite predominantly down-front winds that promote the destruction of stratification. The timing of seasonal restratification was consistent between 1-D model estimates and the observations. However, during up-front winds, the strength of springtime stratification increased over two-fold compared to the 1-D model, with a rapid shoaling of the MLD from >200 m to <100 m within a few days. The ML stratification is further modified under a negative Ekman buoyancy flux during down-front winds, resulting in the destruction of ML stratification and deepening the MLD. These results propose the importance of submesoscale buoyancy fluxes enhancing seasonal restratification and mixing of the Subantarctic ML. a) NCEP wind stress (N m-2) co-located to the time and position of glider profiles and used for the PWP model run. b) MERRA 6-hourly net heat flux (QNET ) at the ocean surface (red (blue) indicates ocean heating (cooling)) indicates a strong diurnal structure with a net positive heat flux into the ML. c) Time series of stratification (N2) averaged for the upper 100 m for SG573 (green line) and the PWP model (magenta line). Shaded areas are as in Figure 3. Thomalla S.J., Gilbert Ogunkoya, Vichi M., Swart S.
One approach to deriving phytoplankton carbon biomass estimates (Cphyto) at appropriate scales is through optical products. 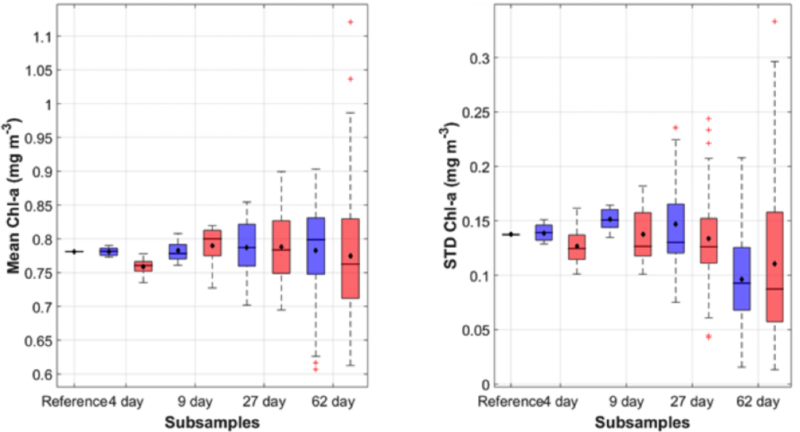 This study uses a high-resolution glider data set in the Sub-Antarctic Zone (SAZ) of the Southern Ocean to compare four different methods of deriving Cphyto from particulate backscattering and fluorescence-derived chlorophyll (chl-a). A comparison of the methods showed that at low (<0.5 mg m−3) chlorophyll concentrations (e.g., early spring and at depth), all four methods produced similar estimates of Cphyto, whereas when chlorophyll concentrations were elevated one method derived higher concentrations of Cphyto than the others. The use of methods derived from particulate backscattering rather than fluorescence can account for cellular adjustments in chl-a:Cphytothat are not driven by biomass alone. A comparison of the glider chl-a:Cphyto ratios from the different optical methods with ratios from laboratory cultures and cruise data found that some optical methods of deriving Cphyto performed better in the SAZ than others and that regionally derived methods may be unsuitable for application to the Southern Ocean. A comparison of the glider chl-a:Cphyto ratios with output from a complex biogeochemical model shows that although a ratio of 0.02 mg chl-a mg C−1 is an acceptable mean for SAZ phytoplankton (in spring-summer), the model misrepresents the seasonal cycle (with decreasing ratios from spring to summer and low sub-seasonal variability). As such, it is recommended that models expand their allowance for variable chl-a:Cphyto ratios that not only account for phytoplankton acclimation to low light conditions in spring but also to higher optimal chl-a:Cphyto ratios with increasing growth rates in summer. Time-evolution of chl-a:Cphyto ratios at the surface (10 m) derived from the 30%POC method (solid lighter green top line), the B05 method (red line), the M13 method (blue line), and the S09 method (pink line). In addition, Chl-a:Cphyto ratios were calculated using the chl-a:POC ratio from the cruise data (which implies that all POC is phytoplankton specific) and is presented as 100%POC (darker green bottom dashed line). Included for comparision are (1) the chl-a:Cphyto ratios derived from the original equation from Sathyendranath et al. (2009) presented as S09original (purple line), (2) the satellite range of ratios from Behrenfeld et al. (2005) (black dotted lines) and (3) the ratios derived from the PELAGOS025 model (McKiver et al., 2015, extracted from the model for the same geographical co-ordinates as the glider transect in time but for a year 2011 simulation, solid black line). The inset shows a detail of the daily signal for the B05 method. Mongwe P., Chang N., Monteiro P.M.S. The Southern Ocean forms a key component of the global carbon budget, taking up about 1.0 Pg C yr−1 of anthropogenic CO2 emitted annually (∼10.7 ± 0.5 Pg C yr−1 for 2012). However, despite its importance, it still remains undersampled with respect to surface ocean carbon flux variability, resulting in weak constraints for ocean carbon and carbon – climate models. As a result, atmospheric inversion and coupled physics-biogeochemical ocean models still play a central role in constraining the air-sea CO2fluxes in the Southern Ocean. A recent synthesis study (Lenton et al., 2013a), however, showed that although ocean biogeochemical models (OBGMs) agree on the mean annual flux of CO2 in the Southern Ocean, they disagree on both amplitude and phasing of the seasonal cycle and compare poorly to observations. In this study, we develop and present a methodological framework to diagnose the controls on the seasonal variability of sea-air CO2 fluxes in model outputs relative to observations. We test this framework by comparing the NEMO-PISCES ocean model ORCA2-LIM2-PISCES to the Takahashi 2009 (T09) CO2 dataset. Here we demonstrate that the seasonal cycle anomaly for CO2fluxes in ORCA2LP is linked to an underestimation of winter convective CO2 entrainment as well as the impact of biological CO2 uptake during the spring-summer season, relative to T09 observations. This resulted in sea surface temperature (SST) becoming the dominant driver of seasonal scale of the partial pressure of CO2 (pCO2) variability and hence of the differences in the seasonality of CO2 sea-air flux between the model and observations. Global ocean summer and winter air-sea CO2 flux climatologies contrasting Takahashi, 2009 (T09) observations for reference year 2000 (a–b), and NEMO-PISCES (1993–2006) (c–d), units mmol C m−2 day. It shows seasonal climatological biases between the model and observations in the Southern Ocean. Nicholson S., Levy M., Joan Llort, Swart S., Monteiro P.M.S. 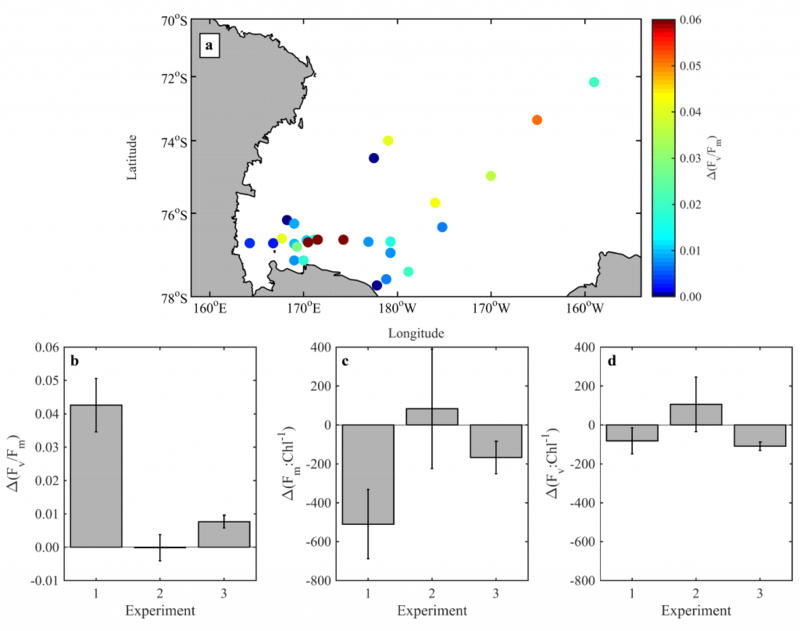 In the Sub-Antarctic Ocean elevated phytoplankton biomass persists through summer at a time when productivity is expected to be low due to iron limitation. Biological iron recycling has been shown to support summer biomass. In addition, we investigate an iron supply mechanism previously unaccounted for in iron budget studies. Using a 1-D biogeochemical model, we show how storm-driven mixing provides relief from phytoplankton iron limitation through the entrainment of iron beneath the productive layer. This effect is significant when a mixing transition layer of strong diffusivities (kz > 10−4 m2 s−1) is present beneath the surface-mixing layer. Such subsurface mixing has been shown to arise from interactions between turbulent ocean dynamics and storm-driven inertial motions. The addition of intraseasonal mixing yielded increases of up to 60% in summer primary production. These results stress the need to acquire observations of subsurface mixing and to develop the appropriate parameterizations of such phenomena for ocean-biogeochemical models. Comparisons of (a and b) primary production, (c and d) DFe, and (e and f) integrated PP, surface PP*64, MLD, and surface DFe between the ‘SXLD surface mixed-layer deepening’ and the ‘subsurface mixing run’. The bioavailability of iron influences the distribution, biomass and productivity of phytoplankton in the Ross Sea, one of the most productive regions in the Southern Ocean. We mapped the spatial and temporal extent and severity of iron-limitation of the native phytoplankton assemblage using long- (>24 h) and short-term (24 h) iron-addition experiments along with physiological and molecular characterisations during a cruise to the Ross Sea in December–February 2012. Phytoplankton increased their photosynthetic efficiency in response to iron addition, suggesting proximal iron limitation throughout most of the Ross Sea during summer. Molecular and physiological data further indicate that as nitrate is removed from the surface ocean the phytoplankton community transitions to one displaying an iron-efficient photosynthetic strategy characterised by an increase in the size of photosystem II (PSII) photochemical cross section (σPSII) and a decrease in the chlorophyll-normalised PSII abundance. These results suggest that phytoplankton with the ability to reduce their photosynthetic iron requirements are selected as the growing season progresses, which may drive the well-documented progression from Phaeocystis antarctica- assemblages to diatom-dominated phytoplankton. Such a shift in the assemblage-level photosynthetic strategy potentially mediates further drawdown of nitrate following the development of iron deficient conditions in the Ross Sea. Spatial distribution of iron stress response with concurrent variable fluorescence changes in long-term iron addition experiments.